To preserve and present the history of New Zealand military aviation for commemoration, inspiration, learning and enjoyment. The Air Force Museum of New Zealand is the national museum for the Royal New Zealand Air Force (RNZAF) and New Zealand military aviation, and stands on the site of the former air base at Wigram, Christchurch. The Air Force Museum of New Zealand had its origins in the RNZAF Historical Centre, established at RNZAF Base Wigram in 1976. This was a small-scale, part-time venture, until 1981 when a formal Air Force Order established the RNZAF Museum as an official Air Force unit, staffed by uniformed Air Force personnel. The Museum initially occupied part of ‘No. 7’ Hangar (since demolished) for all of its activities, including displays, but by 1982, it became apparent that new purpose-built premises would be required. A major fundraising campaign began and many organisations and individuals contributed significantly to the establishment of the facility we have today. The new building was attached to the existing ‘No. 1’ Hangar (now the Aircraft Hall) on Harvard Avenue, and was officially opened on 1 April 1987 as part of the celebrations for the 50th anniversary of the RNZAF. The Museum continued to occupy No. 7 Hangar for its technical and restoration work until moving into ‘No. 2’ Hangar in 1994, just before RNZAF Base Wigram closed in 1995. The first major revamp of the Museum’s galleries occurred in 2008, when the traditional ‘History Gallery’ was completely redesigned and the present ‘Horizon to Horizon’ gallery opened. Another landmark change occurred in 2009, when the Museum Trust Board introduced free admission. This decision was made in recognition of the Museum’s national significance, and a desire to make the RNZAF story as accessible as possible. In January 2013 the Museum Trust Board’s new $16 million, 6,500m² extension was completed, the first major building project since the Museum’s opening. As well as housing the technical and exhibitions teams and Reserve Collection, the space currently known as the Conference & Events Hall will ultimately serve as a brand new display hall. Conference and events operations will continue until approximately 2019 when a new convention centre is expected to open in Christchurch. Today, the Museum is situated on 37 hectares of land and is accommodated in six buildings onsite with a total of approximately 5,000m2 of display area and 14,000m2 of storage and workshop space. It is a world class cultural institution, employing a team of over 30 professional staff, and attracting around 120,000 visitors per year. The Museum is part funded by the RNZAF and part by a charitable trust. The Museum Trust Board, chaired by Air Vice-Marshal Peter Adamson (retired), has governance responsibility for the Museum. The Board decides policy, sets budgets and makes commercial decisions regarding the public aspects of the Museum, while the RNZAF funds facilities management and infrastructure and utilities costs. The Trust Board employs the Communications Team, retail staff, events staff and individuals within other teams employed for special fixed term projects. 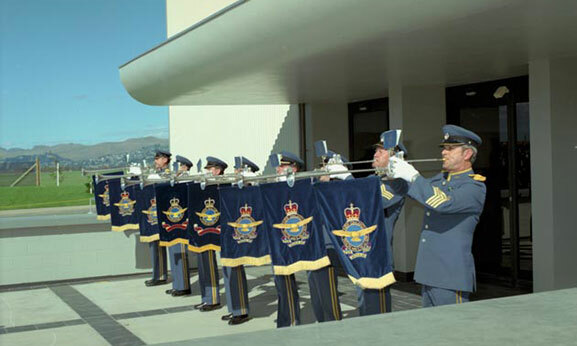 The remainder of the staff employed at the Museum work for the RNZAF, either in uniform or as civilians. We offer a broad range of education programmes, all closely linked to and designed for the New Zealand School Curriculum.